A two-day event at Basanti Devi Colony school saw 60 members of the community learning about the importance of caring for the environment. CRS’s Education Centres teach basics of reading, writing and arithmetic, as well as encouraging artistic expression through dance, music and drawing. An additional strand of learning is environmental awareness so that youngsters appreciate the world around them and the need to care for their local environment and its resources. 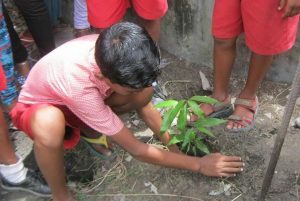 Children from Basanti Devi Colony school and nearby Sukantanagar school, along with women from the community, attended sessions that culminated in the planting of saplings in the compound of the school. Children from the Environment Club have committed to caring for the trees as they grow.